148 years ago today, a battle was being fought that would be remembered as the bloodiest single day in American history. Along the banks of Antietam Creek, Maryland, Union and Confederate soldiers clashed for some 12 hours. By day’s end, in the region of 22,720 men would be dead, wounded or missing. Among the troops that participated in the terrible struggle of September 17th 1862 were the soldiers of Meagher’s Irish Brigade, which included the 63rd New York State Volunteers, by now a largely veteran formation. As the battle unfolded, these Irishmen found themselves marching steadily towards the Rebel positions, which were centred on a naturally defensible sunken road. This road would soon be christened with a name to match the horrors that unfolded there- The Bloody Lane. The Lieutenant-Colonel of the 63rd New York at Antietam was Henry Fowler. After the battle, and while suffering from a serious wound resulting from it, he would have the unenviable task of recording the experiences of his Regiment on that fateful day. With the horrors of the engagement still fresh in his mind, it was not a task that he would find easy. 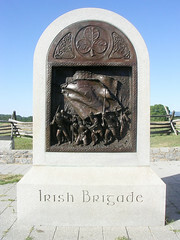 The Irish Brigade were called into action by Major-General Richardson, following which they crossed Antietam Creek and approached the enemy positions under cover of rising ground. Moving into a cornfield, the men were ordered to discard unnecessary equipment and shift from column into line of battle. They would have been aware that only moments now separated them from the fight. The 63rd and their companions set off, advancing towards the enemy. Fowler quickly found himself having to take command of the Regiment, as his Colonel, John Burke, disappeared during the early stages of the battle. The right of the Brigade was made up of the 69th New York and 29th Massachusetts, with the left composed of the 63rd New York and 88th New York. The 63rd advanced on the sunken lane to the right of the 88th. The inferno that the 63rd found themselves in is almost impossible to imagine. 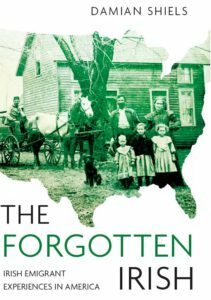 Fowler relates that their numbers were now less than 50 men; the colors were in ribbons and the staff was shot through, with no less than 16 men having fallen while carrying them. It was at this point that the Lieutenant-Colonel was himself wounded, and had to retreat to the rear. Against the odds, the 63rd and the Irish Brigade held, and their efforts played a key role in the eventual capture of the sunken road. Bloody Lane had earned its name. The 63rd’s losses were 202 officers and men killed, wounded or missing. The Brigade as a whole was shattered; it had lost 113 men killed, 422 wounded, and 5 missing. Hi, It is, it was absolute carnage- although the figure isn’t just killed it is killed, wounded and missing altogether. The Irish Brigade at Bloody Lane is one of the most incredible stories of the war. It’s usually presented from the 69th’s perspective. Thanks for sharing a different perspective.